Derived from Japanese SUMO’s matawari (splits) stretch, the Flexcushion® helps to keep one’s pelvis neutral while seated. Thus, it makes it easier to stretch muscles around pelvis and hip joint, such as hamstrings, adductor muscles. Versatile and durable! It is widely used for Stretch, Pilates, Yoga, and rehab. • Choose the color, “Black” or “Beige”. • Manual included. About 25 stretch & core training workouts supervised by Dr. Donald A. Chu. 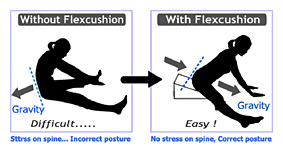 FREE Flexcushion® DVD-Video “Stretch & Exercise” supervised by Dr. Donald A. Chu, with each Flexcushion® purchased. • Especially beneficial for those who are rigid. • Versatile! The Flexcushion® helps to improves flexibility, core strength, and posture. • Can be used for group lesson and personal training. For Stretch, Yoga, Pilates, and for Rehab. • Light and portable! Weighs less than 2.7 lbs. • Holds up to 300 lbs, tested with sumo wrestlers. We have used the Flexcushion® in our practice of physical therapy and performance development for athletes for some time now. I personally use it in my home to maintain range and flexibility in my low back and lower extremities. The Flexcushion® has been instrumental in helping athletes’ overall development. Our NFL players like the Flexcushion® for maintaining hamstring and hip flexibility prior to beginning their training programs. As the Flexcushion® was initially developed for work with Sumo wrestlers, these athletes who weigh over 290 pounds each are able to relate to the stretching techniques and methods available on the Flexcushion. Even our low back and hip patient population are able to stretch so much more effectively with this device, so much so, that we use it across the board in our rehabilitation programs as well. I highly recommend the Flexcushion® for increasing and maintaining a healthy low back, and flexible and strong trunk area! Click here to download a PDF file (1.1MB) of the Flexcushion® Product Description.